PLEASE NOTE: This show is completely sold out! Join our mailing list, above, for information about future Sinkane shows. We’re delighted to be working with Sinkane for the first time! Sinkane music — every note of it — comes straight out of a generosity of spirit. Never has that spirit been on more vivid display than on the uplifting new album Life & Livin’ It. This is feel-good music for trying times, celebrating what makes life good without ignoring what makes it hard. Ahmed soon brought the band in to help with the material, testing the songs at a four-show residency of sold-out shows at Union Pool in Brooklyn where the audience’s reception fed the creative process. They toured throughout the summer before setting up shop at Sonic Ranch Studios in El Paso, Texas. Once again produced by Ahmed with lyrics and help from longtime collaborator Greg Lofaro, the album draws from the best elements of Sinkane’s previous records: the slinky funk and soul grooves are there, so are the sparkling melodies with roots in sub-Saharan Africa. With basic tracking played together live, the fun and immediacy of Sinkane’s live show is a central feeling of the recordings. 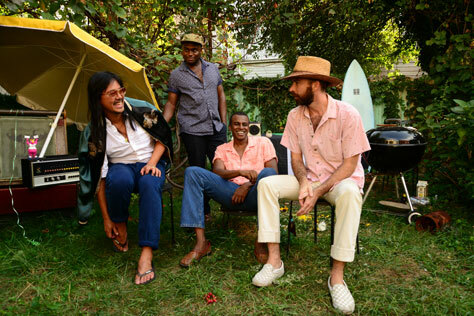 The four members of Sinkane – bassist Ish Montgomery, drummer Jason Trammell, guitarist Jonny Lam and Ahmed – sang and played additional parts on every song, with Trammell contributing lyrics to Theme from Life & Livin’ It, and Lam helping with arrangements. Jas Walton and Jordan MacLean of Daptone recording artists Antibalas contributed horns. True to its name, Life & Livin’ It is an album about all kinds of experiences. When Ahmed Gallab sings, he sounds unafraid yet vulnerable. But while he once sang of feeling like he was on the planet Mars, Ahmed is now firmly grounded on Earth. He’s no longer searching for his home — he has created a home for himself. There’s a party there, and Life & Livin’ It is playing on the stereo. You are invited. Local support comes from Arctic Turn. Arctic Turn is an alternative seven-piece spearheaded by multi-instrumentalist and song writer Philip K. Marzouk. With influences ranging from Everything Everything to St. Vincent to Chance the Rapper to Roger Troutman, they always manage to create something unique with each track. Expect layers of harmonies and big crescendos.